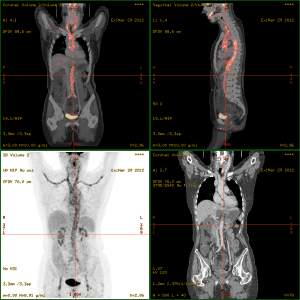 The certificate in Positron Emission Tomography (PET) formally prepares the Imaging Technologist in Radiologic Technology, Nuclear Medicine, or Radiation Therapy to work in an PET Imaging lab. All courses in this certificate program are a part of the Radiation & Imaging Sciences (RAIS) degree program and may be counted towards completion of a Bachelors of Applied Science at Bellevue College. Approximately 10-15 certificate students are admitted each admissions cycle to this program. The curriculum begins each fall and spring quarter. Classes are completed online in 4-6 quarters, depending on start quarter and course load. The program consists of 5 didactic courses totaling 20 credits and one – 12 credit clinical practicum. All didactic courses are completed online. Clinical practicums are offer the opportunity to work beside a Positron Emission professional at a clinical location. Clinical practicum placements are dependent upon grades, site availability, and approval. Upon completing these courses, students should be able to evaluate PET images as related to the exam requested and the pertinent clinical information and manipulate PET instrumentation to produce the desired image results. Additionally, students should be able to identify pertinent anatomy on images in all of the various planes and relate pertinent pathology to appropriate scan protocols. Clinical practicums are designed to provide students with the opportunity to complete required clinical competencies as identified by the America Registry of Radiologic Technologists. We cannot guarantee students will receive all required competencies. Students may be required to complete competencies on their own time or by completing additional clinical hours. Interested students must an Imaging Technologist in Radiologic Technology, Nuclear Medicine, or Radiation Therapy or completing their final year in one of those imaging programs. Students must also have completed Anatomy & Physiology I and II from a regionally accredited institution. Career Outlook –Nuclear medicine technologists are experiencing a 10% job growth outlook. That is faster than the average occupation (bls.gov). Good Pay – The annual average wage of Magnetic Resonance Imaging Technologists in Washington is $82,390-$109,980. That is among the highest in the nation as reported in May 2017 (bls.gov). Advanced degree opportunities available at Bellevue College – Bellevue offers several bachelors degree options in an online format to help you advance your education while continuing to work! This program is for Imaging Technologist in Radiologic Technology, Nuclear Medicine, or Radiation Therapy. Current imaging students may also apply to this program in their final year of their Imaging program. Bellevue College’s Positron Emission Tomography (PET),Certificate of Accomplishment is a selective admissions program. All students must apply to Bellevue College prior to completing the online Magnetic Resonance (MR) Imaging Positron Emission Tomography (PET) application. Specific instructions have been provided for this program. Please note, by completing the online Magnetic Resonance (MR) Imaging Positron Emission Tomography (PET) application, you are applying to the Radiation and Imaging Sciences Positron Emission Tomography (PET) program only.